BoyRaket.com: Fiery Style Southwestern Flaming Grill Now Open in Southwoods Mall! 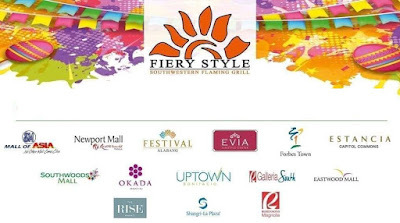 Fiery Style Southwestern Flaming Grill Now Open in Southwoods Mall! Hola! Fiery Style is now open down south, well it's down south of Luzon there is! This Mexican resto that has the Best Nachos in Town is the newest food pool in Southwoods mall that is the first ever full-scale lifestyle mall in the South that offers state-of-the-art cinemas, superb shopping stores and major dining destinations. Located in Binan Laguna, this is some resto that you can definitely go to to fulfill your craving for Mexican Food. This resto is well known for there best tasting taco's but that is not just the only food or snack that you can dive into when you go there. I'm not a taco kind of person but the taco that they have is not only very enticing and instagrammable but delicious as well! I was able to get first hand experience of the pleasant Mexican Ambiance and dining on their opening last January 12, 2019. This is probably one of the few times that I've seen a resto so jam packed on their start date. I enjoyed all of the dishes that we tried which I will share in a bit. There is definitely something for everybody's taste bud, from sea food to steaks, from appetizers to dessert even from cocktails to beer. Some of the dishes we tried are Surf and Turf, Galleon of Bones(shrimp of barbeque ribs, chicken wings, and meaty pork hammers, beef ribs served with southwest chips), Lord of the Wings(A 24 chicken wings set beautifully and uniquely presented with 3 flavors to choose from: the Hot Hot Hot Sauce & Jalapenos, Nacho Cheese Sauce and Bacon and Texan-style barbeque), Assorted Steaks from the family size steaks to my favorite 10 oz. US Rib Eye steak. All are very tasty and meets your expectation when it comes to steaks which is meaty and will sure make your belly full. I suggest that you order the Steak Ala Familia as "Pulutan" if you'll end up drinking cocktails or beer with your friends. I also like the combinations of buffalo wings particularly liked the Jalapeno and Naco cheese flavors. When it comes to the ambiance and the place, in Southwoods mall alone the location is pretty classy and comfy so much more from the restaurant interior were you can feel the Mexican resto spirit from it, although the band playing is local, you will still enjoy the dining experience on your stay.